"The patient, a woman of 26, hypoparathyroid after subtotal thyroidectomy, developed severe signs of vitamin D poisoning, including ataxia and changes in the electroencephalogram, after maintenance for about 21/2 months on 100, 000 "units" of vitamin D and 16 g calcium lactate daily. Signs and symptoms rapidly responded to an intramuscular injection of 20 ml 50% magnesium sulfate, and serum Ca fell from 23.7 mg per 100 ml to normal in 5 days. The patient was subsequently maintained on 25, 000 units of vitamin D and 10 g calcium lactate daily. It is suggested that the neurological findings may have been due partly to Mg deficiency secondary to hypercalcasmia." jimmylegs, this information on vitamin D3 and hypercalcemia is of great interest to me. About 16 months ago I had hypercalcemia (serum Ca was 14.6 mg/dL, which was corrected to normal after 5-6 weeks of 24-hour IV). If you can, please add the link for the source, I would like to be able to show it to my doctor. Thanks in advance. the paragraph titled Primary End Points by Serum Folate or Cobalamin Levels has useful-looking target range info. A 74-year-old woman presented to the neurology clinic with worsening of her longstanding peripheral neuropathy of unknown cause. There was below knee loss of spinothalamic sensation, reduced joint position of toes, absent below hips vibration sensation and absent ankle jerks. Neurophysiology studies showed further progression of her axonal sensory neuropathy. Urine and blood analysis previously carried out in Australia suggested elevated levels of arsenic. After abstinence from seafood, a random urine sample was collected and this confirmed the elevation in urine arsenic (622.1 nmol/L, reference range <534 nmol/L). The household water was found to be uncontaminated and the patient had no occupational or environmental exposure to arsenic. On questioning the patient admitted to taking fish oils, omega-3 oils and glucosamine sulphate dietary supplements in excess of the recommended dosage. These supplements were identified as possible sources of arsenic and the patient was asked to stop all supplements. One month later the urine arsenic had reduced to 57.5 nmol/L. There was an improvement in patient wellbeing, she no longer required Gabapentin for pain relief and the neurophysiology studies also showed improvement. Clinicians should consider heavy metal toxicity as a cause of peripheral neuropathy of unknown cause. A detailed patient history including all dietary supplements is essential to help elucidate the source of heavy metal toxicity. Nishida, K., & Uchida, R. (2018). Role of Zinc Signaling in the Regulation of Mast Cell-, Basophil-, and T Cell-Mediated Allergic Responses. Journal of Immunology Research, 2018. "Zinc is essential for maintaining normal structure and physiological function of cells. Its deficiency causes growth retardation, immunodeficiency, and neuronal degeneration. Zinc homeostasis is tightly regulated by zinc transporters and metallothioneins that control zinc concentration and its distribution in individual cells and contributes to zinc signaling. The intracellular zinc signaling regulates immune reactions. Although many molecules involved in these processes have zinc-binding motifs, the molecular mechanisms and the role of zinc in immune responses have not been elucidated. We and others have demonstrated that zinc signaling plays diverse and specific roles in vivo and in vitro in studies using knockout mice lacking zinc transporter function and metallothionein function. In this review, we discuss the impact of zinc signaling focusing particularly on mast cell-, basophil-, and T cell-mediated inflammatory and allergic responses. We also describe zinc signaling dysregulation as a leading health problem in inflammatory disease and allergy." Najafabadi, M. M., Faghihi, G., Emami, A., Monghad, M., Moeenzadeh, F., Sharif, N., & Davarpanah Jazi, A. H. (2012). Zinc sulfate for relief of pruritus in patients on maintenance hemodialysis. Therapeutic Apheresis and Dialysis, 16(2), 142-145. "According to the inhibitory effects of zinc on histamine release and reported low levels of serum zinc in hemodialysis patients, we aimed to evaluate the effects of zinc sulfate for the relief of pruritus in these patients." Sanada, S., Kuze, M., & Yoshida, O. (1987). Beneficial effect of zinc supplementation on pruritus in hemodialysis patients with special reference to changes in serum histamine levels. Hinyokika kiyo. Acta urologica Japonica, 33(12), 1955-1960. "In this study, we examined the serum zinc and histamine levels in 19 hemodialysis patients with persistent pruritus and the effect of zinc supplementation on the pruritus. In patients with pruritus, the serum zinc level decreased and serum histamine level increased, showing a negative correlation between them. Oral zinc sulfate, 445 mg daily for two months, relieved pruritus subjectively in 53% of the patients. After treatment, serum histamine levels decreased significantly, as well as serum zinc levels increased significantly. These findings suggest that zinc deficiency participates in increased histamine levels in dialysis patients, and subsequently in the development of uremic pruritus." Marone, G., Columbo, M., De Paulis, A., Cirillo, R., Giugliano, R., & Condorelli, M. (1986). Physiological concentrations of zinc inhibit the release of histamine from human basophils and lung mast cells. Agents and actions, 18(1-2), 103-106. "We have previously shown that physiological concentrations of zinc (≃ 7× 10− 6 M) inhibit the release of histamine from human basophil leukocytes (Marone et al., J. Pharmacol. Exp. Ther. 217: 292, 1981)." Objectives: There is growing evidence that women using OCs change in serum trace elements and vitamins. 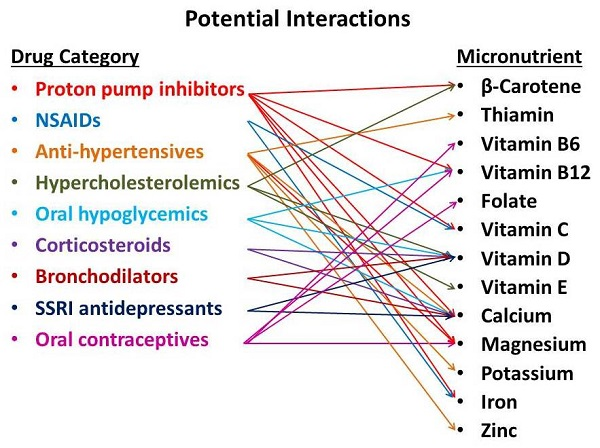 Nowadays, in many cases, side effects associated with low levels of micronutrients are not considered during oral contraceptives (OCs) therapy. This review aims at checking the present literature in order to verify the evidences. Our purpose is to underline this aspect contributing to improve the therapeutic approach with OCs. Methods: Systematic literature search was performed in electronic databases, covering the period from January 1967 to January 2012. Results: Ninety-five articles were located; a cross sectional randomized and three RCTs studies were considered eligible. Conclusions: [b]A decrease in the serum concentrations of zinc, selenium, phosphorus and magnesium have been reported in OC users. Such reductions were proportional to the duration of contraceptive use. [/b] These reductions may imply a reduction in the probability of having a pregnancy and/or an increase of serious illness for the unborn. In this regard, a supplementation with the above compounds could be useful in OC users, namely for reducing side effects. The incidence of multiple sclerosis (MS) is rising in women. To determine whether the use of combined oral contraceptives (COCs) are associated with MS risk and whether this varies by progestin content. We conducted a nested case-control study of females ages 14–48 years with incident MS or clinically isolated syndrome (CIS) 2008–2011 from the membership of Kaiser Permanente Southern California. Controls were matched on age, race/ethnicity and membership characteristics. COC use up to ten years prior to symptom onset was obtained from the complete electronic health record. We identified 400 women with incident MS/CIS and 3904 matched controls. Forty- percent of cases and 32% of controls had used COCs prior to symptom onset. The use of COCs was associated with a slightly increased risk of MS/CIS (adjusted OR = 1.52, 95%CI = 1.21–1.91; p<0.001). This risk did not vary by duration of COC use. The association varied by progestin content being more pronounced for levenorgestrol (adjusted OR = 1.75, 95%CI = 1.29–2.37; p<0.001) than norethindrone (adjusted OR = 1.57, 95%CI = 1.16–2.12; p = 0.003) and absent for the newest progestin, drospirenone (p = 0.95). Our findings should be interpreted cautiously. While the use of some combination oral contraceptives may contribute to the rising incidence of MS in women, an unmeasured confounder associated with the modern woman’s lifestyle is a more likely explanation for this weak association.